The purpose of the Compliance Management System is to ensure that the products and services provided to our customers consistently meet or exceed their expectations. The company operates a system that regularly evaluates its processes and customer needs, and has set quantifiable goals with plans in place to ensure that they are improved year on year in accordance with BS EN ISO 9001 – Quality Management System requirements, BS EN ISO 14001 Environmental Management Systems. Written to all Standards, Codes of Practice and Schedules as listed within AS11 Standards Adherence Document. GR8 Security further commit that it is their intention to comply with all the statutory and regulatory requirements and periodically evaluate compliance (including review of legislation via a legislation register) with the same during the management review. It is the policy of GR8 Security Limited to maintain and improve, on a continual basis, an effectively managed Compliance Assurance Programme, which will assure customers that the products supplied conform to the laid down procedures or disciplines of the company, which will ensure that we meet the customers’ needs and expectations. The Management of GR8 Security Limited is firmly committed to the procedures included in this Compliance Manual, and the total participation of all personnel is mandatory. The QA is entrusted with the authority and responsibility for the control of the Compliance Management System. The QA cannot be over-ruled on matters of Compliance and in the event of differences of opinion on Compliance matters, the Managing Director has the responsibility to refer such items to the MD for resolution. This policy of Compliance Assurance is in place to ensure that the overall organisational goals of the company are met. The goals of this company are to ensure that the best possible product is supplied to our valued customers, and that we are able to meet their needs and requirements as effectively and efficiently as possible. Our organisational goals are to ensure that the changes required within our documented management system to meet the requirements of BS EN ISO 9001, BS EN ISO 14001 written to all Standards, Codes of Practice and Schedules as listed within AS11 Standards Adherence Document, which are performed in a managed methodical way to ensure that the system is fully understood and implemented throughout the company. GR8 Security Limited will make this Policy available to all stakeholders, shareholders, staff and general public on request. • Ensuring effective and expedient incident control, investigation and reporting. Managerial and supervisory staffs have responsibilities for the implementation of the policy and must ensure that environmental issues are given adequate consideration in the planning and day to day supervision of all work. It is the policy of GR8 Security to continually improve an effectively managed Environmental Management programme. 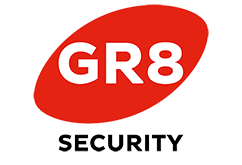 GR8 Security will fully comply and commits to fulfil its obligations with the duties placed upon it within the requirements of legislation, whilst at all times complying with, as a matter of best practice, the requirements and duties set out within Approved Guidance as issued by the Environment Agency and other organisations. As part of the company’s commitment to maintaining the highest levels of environmental management including prevention of pollution as stated above. Environmental objectives are set within the Critical Success Factors document, reviewed regularly and reported within the annual management review. GR8 Security will make this Policy available to all stakeholders, shareholders, staff and general public. GR8 Security will take all practical steps to ensure that potential hazards and risks to the environment are identified and that suitable and effective preventive and control measures are implemented. All employees will be provided with the necessary resources, equipment, information, instruction and training to fulfil the requirements of this policy. The Managing Director has overall responsibility for all environmental matters. The operation of this policy and the associated procedures will be monitored and reviewed on a regular basis to ensure that they remain current and applicable to the company’s activities. This policy has been endorsed by the Managing Director who gives his full support to its implementation. GR8 Security Ltd aims to ensure, so far as is reasonably practicable, the health, safety and welfare of our employees while they are at work and of others who may be affected by our undertakings. This general policy statement provides a commitment and intent to comply with the Health and Safety at Work etc. Act 1974. It is the company’s policy not to discriminate against its workers on the basis of their gender, sexual orientation, marital or civil partner status, gender reassignment, race, religion or belief, colour, nationality, ethnic or national origin, disability or age, pregnancy or trade union membership or the fact that they are a part-time worker or a fixed-term employee. Our workers and applicants for employment shall not be disadvantaged by any policies or conditions of service which cannot be justified as necessary for operational purposes. The company shall, at all times, strive to work within legislative requirements as well as promoting best practice. We are committed to a programme of action to make this policy effective and to bring it to the attention of all workers. The principle of non-discrimination and equality of opportunity applies equally to the treatment of visitors, clients, customers and suppliers by members of our workforce and also, in some circumstances, ex-employees. supervision, on behalf of a company. or adequately controlled, whilst company business is being undertaken. • Management of Health and Safety at Work Regulations 1999. • review this policy at least annually or more frequently if significant changes occur. to identify any trends and ensure that serious injuries are appropriately reported. GR8 Security Limited collects and processes personal data relating to its customers. The organisation is committed to being transparent about how it collects and uses that data and to meeting its data protection obligations. 6. Site/Venue Information including information required to complete Surveys, Assignment Instructions, Risk Assessments, emergency contact information including keyholders and signed contracts. This data will be stored on our internal servers or hard copy in secure locations, password protected if relevant and backed up. Data will not be held longer than is necessary, and in line with our document control procedure. GR8 Security Limited processes personal data to provide a Security Service, with the permission of the customer. 1. Your information is shared with GR8 Security Limited staff to enable the provision of a security service. 2. All staff employed by GR8 Security Limited have undergone security screening in line with BS 7858. 3. Where necessary the organisation will share your data with specific third parties, such as the emergency services, governing body or assessing body to enable the provision of a security service. 4. The organisation may also share your data with third parties in the context of a sale of some or all of its business. In those circumstances the data will be subject to confidentiality arrangements. GR8 Security Limited will not share your personal data with any other third party without your express permission. Personal data, such as contact details, will be kept for the duration of the client contract plus a further 3 years, in line with our data retention procedure. Any video recording will be retained for a minimum of 30 days, after which it will only be retained if there is a requirement ie for court evidence. 3.	require the organisation to delete or stop processing your data, for example where the data is no longer necessary for the purposes of processing. If you would like to exercise any of these rights, please contact the Data Controller as detailed below. Where we will respond within 30 days. The personal data is required to enable GR8 Security Limited to provide a Security Service. All personal data provided is done by the customer’s consent. Failure to provide the data required would greatly hinder the ability of GR8 Security Limited to provide this service.